A well loved and cherished high set family Queenslander to legal height set on 982m2, featuring a beautiful native garden and pool situated in the central suburb of Hermit Park. Your family will be able to move in and enjoy all the benefits to this wonderfully renovated family home. Every aspect of this high-set Queenslander has been lovingly renovated and restored for a family, by a family over the past 25 years. Constructed around the early 1900s the current owners have strived to keep the original features of the house such as chamfer boards and exposed studs, casement and sash windows, wooden louvers, metal pressed metal window hoods, French doors and hoop pine timber floors. This two level home offers five bedrooms, two large main bedrooms on each level, with the remaining bedrooms available as either bedrooms, studies or home office spaces. The entire house is air-conditioned with split systems. There are two bathrooms, one on each level, with the laundry contained in the ground floor bathroom. The upper level entrance flows through from the front verandah to the main living area with intricate fretwork archway and spacious 12 foot high timber ceilings. Towards the rear of the house, there is a generous entertaining deck connecting to the kitchen and dining areas. The recently renovated kitchen has granite tops, an open servery to the deck, state of the art Miele appliances and a well-appointed pantry. The main bedroom opens to the front veranda and main living/dining area, is spacious and breezy, along with a recently renovated walk-in wardrobe. Retreat areas for parents are all over the property and including a recently renovated library room with an elegant archway, quiet and breezy spots on all verandas, and shady hammock hideaways beneath large shady trees, allowing time away from the hustle and bustle of the household. An internal stairway secured by kwila slats provides easy and secure access between the two levels. The ground floor invites you in with stained glass double-glazed wide timber doors that lead through the centre of the family room entertainment to a large rear deck, complete with kitchenette, great for outdoor dining and entertaining or just to relax and enjoy. A free-form concrete saltwater swimming pool, covered by two large umbrellas, provides a welcome summer retreat and reduces water evaporation. On the western side of the house suitable is a carport for two cars with roller door access to the workshop. 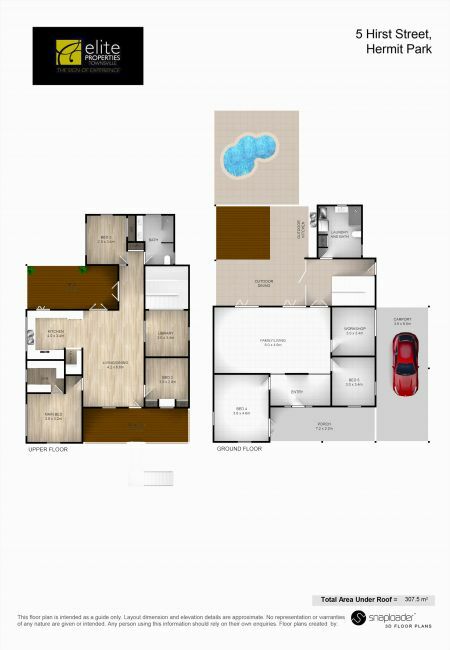 This open plan home offers an opportunity for the family to live and relax or entertain. With its unique charm and position this beautiful heritage style Queenslander. The internal stairway gives you the ability to utilize all the downstairs area. The house is designed around the natural weather – shutters on the eastern side capturing the prevailing breezes. What induced you to buy the property? When family or friends visit, what do they point out at the benefits of your home? When renovating have tried to keep in mind the feel and history of the house that first attracted us to buy it. Our splash back in our main kitchen shows a bit of that history.